CodeWeavers CrossOver now has support for the Oculus Rift! Well, our internal testing builds do, anyway. 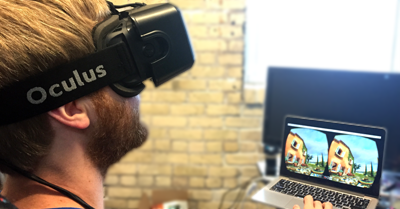 Here at CodeWeavers, we're excited about what virtual reality can bring to gaming and other computing applications. The Oculus Rift is currently the largest VR (Virtual Reality) headset available for purchase, so we've decided to integrate support for it into CrossOver. Once we've released support in our public builds, playing Windows Oculus games with CrossOver on your Rift will be just as easy as with any native Mac OSX or Linux Oculus application. Integration between your Windows Oculus application and your hardware should be seamless. We've been "testing" ;) with a DK2 here in the office, and it's been an impressive experience. Caveats? There's a couple. This is an experimental feature in CrossOver, and some games access the Rift hardware in a way that Wine doesn't yet support. We hope to have this repaired soon, but some particular applications may fail to detect the Rift hardware. More worryingly, Oculus has decided to drop support for Linux and OSX. While our Oculus integration works for now, it does depend on your having a Linux or Mac OSX SDK, which is no longer supported by Oculus. Depending on changes to future Windows Oculus SDK versions, we could fail to support games built against those new SDKs. But don't lose hope! It would be difficult, but we could build support for the Windows Oculus SDK in CrossOver. That's right: CrossOver could become the only way to use the Oculus Rift on Mac OSX and Linux. But this is all hypothetical. It depends on what Oculus decides to do for their Linux and Mac users. If you've got a Rift and are interested in trying out our support, contact our Caron at caron@codeweavers.com and ask for a nightly build. If you want more information about our solution for Oculus, contact our sales team at sales@codeweavers.com. We'd love to have your support and feedback. We're also interested in building support for other VR headsets. As soon as some other headsets come on the market, like Valve and HTC's Vive headset or Microsoft's HoloLens, we'll be thinking about adding support so you can have the freedom to use your Windows VR games and applications on Linux and OSX. Andrew has been a Wine developer at CodeWeavers since 2009. He works on all parts of Wine, but specifically supports Wine's audio. He's also a developer on many of CodeWeavers's software ports. Founded in 1996 as a general software consultancy, CodeWeavers focuses on the development of Wine – the core technology found in all of its CrossOver products. The company's goal is to bring expanded market opportunities for Windows software developers by making it easier, faster and more painless to port Windows software to Mac OS and Linux. CodeWeavers is recognized as a leader in open-source Windows porting technology, and maintains development offices in Minnesota, the United Kingdom and elsewhere around the world. The company is privately held.